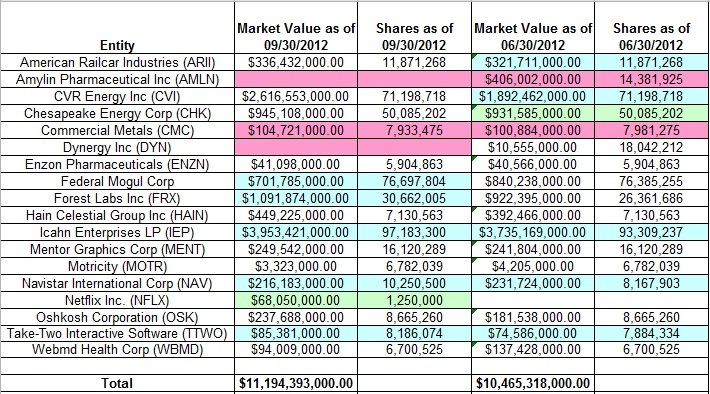 Icahn's portfolio value increased by around 7% this quarter from $10.47B to $11.19B. There were several marginal increases and just one marginal decrease (Commercial Metals - CMC) to his holdings this quarter. The two large stakes in natural gas related businesses were left untouched during the quarter: CVR Energy Inc. (CVI) and Chesapeake Energy Corporation (CHK). Other activity in the quarter include a ~17% stake increase to the long-term Forest Labs (FRX) position and a ~25% increase to the Navistar (NAV) position. FRX and NAV are trading near the lows for the year and so they are good option to consider for anyone following Ichan's trades. The only other significant activity was a 0.6% stake in Netflix (NFLX). The position has since been built up to a stake more than 10% and Icahn is getting ready for another of his famed proxy battles with the company management.